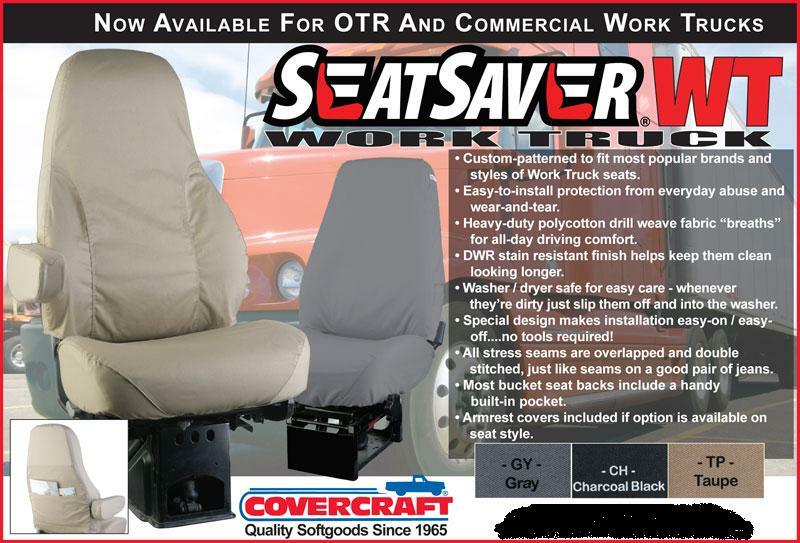 Covercraft Truck SeatSaver patterns for commercial and OTR (over the road) trucks. Durable polycotton fabric takes the abuse instead of the surface of your seat & the fabric gets softer with age like a good pair of jeans - for your seat! Custom-patterned Single Bucket Seat Covers for OTR/Air-Ride Seats. Available in heavy duty breathable jean-like Polycotton fabric or rugged urethane-coated waterproof material. These seats are sold as singles (one seat cover) and include two armrest covers which can be used or discarded. These seats are commonly found on heavy duty or OTR applications like Freightliner, Mack, Volvo and others. Seat identification can usually be found on a label located at the rear base support of the seat. Custom fitted, slip-on / slip-off protection from everyday abuse. Heavy-duty polycotton drill weave fabric 'breathes' for all-day comfort. Waterproof fabric is best for wet work environments like line crews, tow trucks, etc. Washer / dryer safe for easy home care. When they're dirty, just slip them off and into the washer. Seatbacks include an handy built-in pocket. Whether you drive coast to coast or to local work sites, your work truck seat covers take a beating every day. Even the sturdiest truck seat cover materials can stand up only so long under hard working conditions. 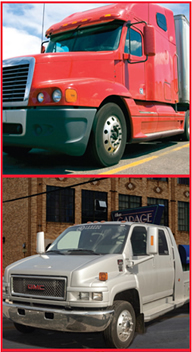 Seat Saver truck seat covers work truck seat protectors help preserve your seats in these adverse conditions. These custom fitted slip on/off truck seat covers are made tough, can be removed and reinstalled quickly and are washer and dryer safe for easy cleaning. Seat Saver truck seat covers are made from heavy-duty poly cotton drill weave fabric that 'breathes' for comfort during all weather conditions. This fabric also blocks UV rays from damaging the material or leather. All Seat Saver truck seat covers stress seams are overlapped and double stitched, just like your jeans. Strong protection for a tough job! Seat Saver truck seat covers work truck seat protectors are available in Gray, Charcoal and Taupe to compliment your truck's interior. A handy built-in storage pocket is included on the back of most Seat Saver truck seat cover patterns.